Get ready for a lot of pictures! I will apologize in advance, but I just had so much fun making this quilt and I couldn't decide which photos to keep. So, as I mentioned in my "quilt top" post for this one, I made this little quilt as a class example for next week's Sewing Summit in Salt Lake City. Kati and I are going to be teaching Shapes and Angles and will be going over partial seams, y-seams (via hexagons), equilateral triangles and diamonds. 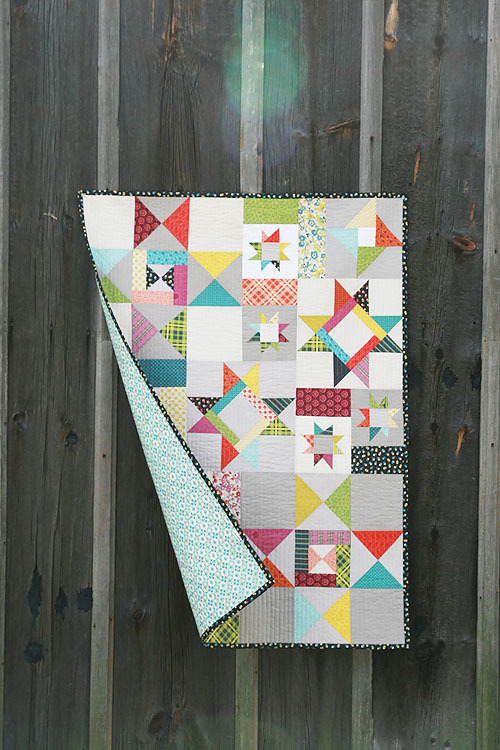 I designed this quilt using 3 types of star blocks that all incorporate partial seams, and then little wonky stars to fill in the spaces. 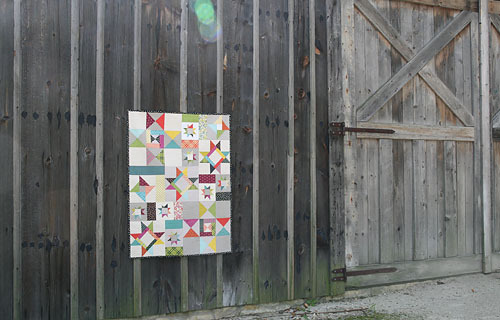 The pieced blocks range in size from 6" to 18". 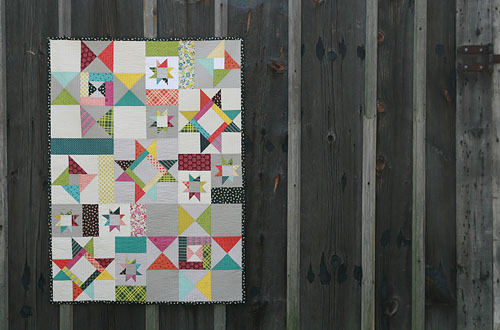 The 12" star is the Another Star block from my Solstice Stars Series. Except instead of making it the "cheating way" that I show in the tutorial (minus the partial seams), I do it the "correct way" (with the partial seams). I decided to use about 5 shades of tan, just from my stash, for the backgrounds. A few months ago I was itching to add some neutrals to my stash to have on hand for projects like this. I pulled out my solid color cards and just ordered 1/2 yard to 1 yard of a bunch of Free Spirit, Kona and Bella neutrals. I asked the shops to label them for me because I knew once they arrived it would be a bit tricky to figure out exactly what they were. 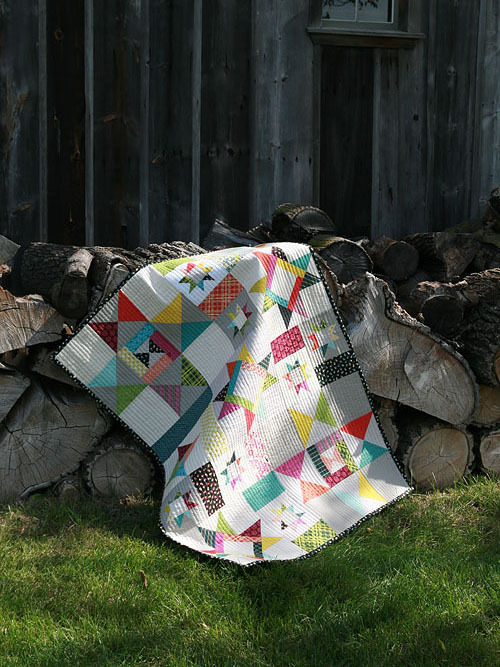 The prints in this quilt are almost all by Denyse Schmidt - specifically her Chicopee line...I think I've mentioned how much I love it, yes? :) I hope you aren't sick of seeing me use it yet, I'm sure I'm not done! I mixed in some of Denyse's fabric that she sells at JoAnns and also a print from Anna Maria Horner's old Good Folks line because I wanted some more greens in there. I'm officially out of the one print I used, kind of makes me sad but I'm happy I was able to use it in a project that I love. This quilt is 36" x 48". I didn't want to make it huge because I really don't want to check a bag going to SLC. I am thinking of making this into a pattern and if I do that, it will likely be larger. I struggle with writing patterns with scrappy piecing because it gets confusing when figuring out fabric requirements. 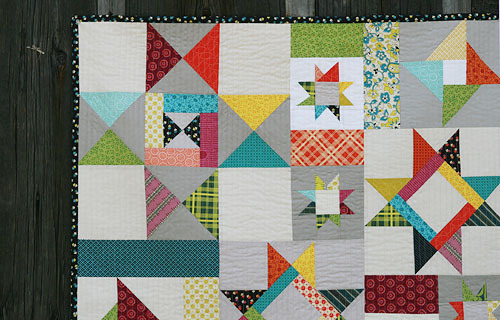 When you make a pattern, are you ok with seeing fabric requirements that say "xyz yards total in a mix of prints" rather than having each amount of scrap prints spelled out? I'm going to think on it for awhile. I quilted this with straight lines, about 1/2" apart. The backing is another one of Denyse Schmidt's prints from JoAnns. Those going to the Sewing Summit, I can't wait to see you all next week! I hope if you see me you will come up and introduce yourself. Trust me, I know how it can be scary to meet new people. Believe it or not I can be pretty shy (except for teaching for some reason). For those staying home this time, I will try to take a lot of photos to share when I get back. 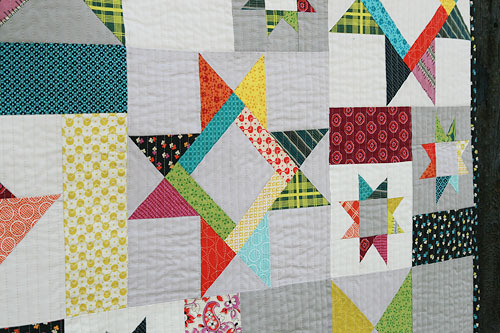 I still have one more quilt I'm hoping to finish for another class example - fingers crossed!